The seventh season of the American sitcom The Big Bang Theory premiered on CBS on September 26, 2013 with two episodes back-to-back. 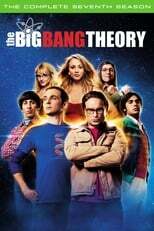 On January 12, 2011, The Big Bang Theory was renewed for an additional three years, extending it through the 2013–14 season for a total of seven seasons. Production for the season began on August 14, 2013.